Nepal, Country of Honor at the 5th Sichuan International Travel Expo (SCITE) 18 held in Leshan, China from 6 to 9 Sept 2018 received unprecedented religious and tourism mileage as the Birthplace of Lord Buddha. Hon Minister for Culture, Tourism and Civil Aviation, Rabindra Prasad Adhikari led the official Delegation of MPs, Mayors of Lumbini, Tansen and Ramgram, NTB, Lumbini Devt Trust and private sector members. Nepal Tourism Board has coordinated the entire event in China. 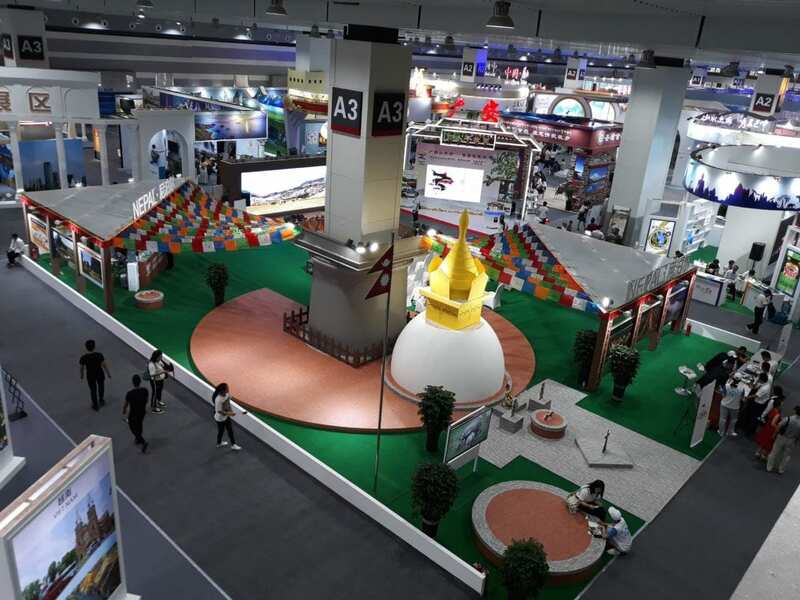 He addressed the opening ceremony at the SCITE and visited the Nepal Pavilion in addition to holding several high-level meetings with the Governor of Sichuan, the Mayor of Leshan, Heads of the famous Dado Zen temple and Leshan Buddha temple to discuss mutual cooperation and promotion of tourism in the very potential China market. The highlight of the visit was the signing of MOU between Leshan, the home of the biggest Buddha statue in the world and Lumbini, Tansen and Ramgram for the promotion of Buddhist tourism. Today, A special ceremony was held for handing over the holy soil from Lumbini to the Leshan Buddha Museum where it has been consecrated with great honor. Inaugurated by His Excellency, Lila Mani Poudyel, the Nepal Week, a week-long exhibition and sale of Nepalese handicrafts with over 50 stalls, culinary delights, photo exhibition, live pottery, and cultural dances is being held at Leshan for the Chinese public. Hon Minister Adhikari and the Mayor of Leshan have expressed great commitment in strengthening the ties between Leshan and Lumbini and this will definitely go a long way in promoting Nepal’s tourism in China. NATTA participated in the B2B sessions at the SCITE. The Visit Nepal 2020 Campaign promotion in China is off to a great start. Older PostMalaysia Tourism: Will PATA protest lesbian caning at PATA Travel Mart in Langkawi?